Oddity: Only one double, the rest were singles. 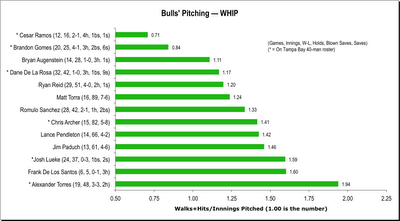 For the first time in what seems a very long time, Bulls pitching was superb. Three very important guys are back from Tampa Bay. They may not be very happy with their status, but Bulls fans should be. Chris Archer had a solid five innings with 7 Ks. 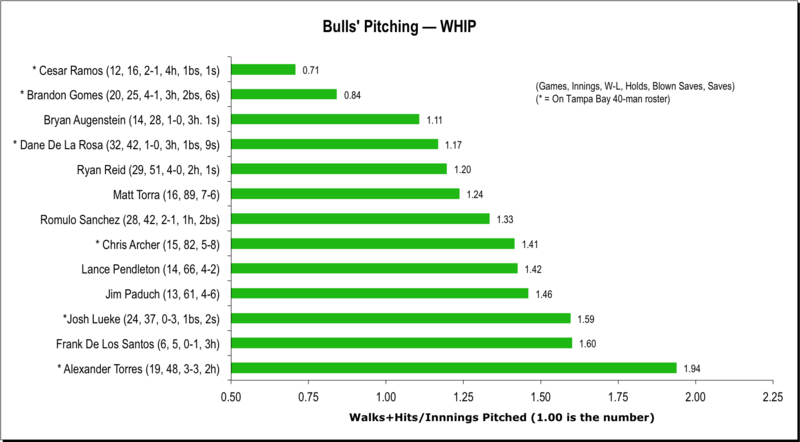 Cesar Ramos, in his first appearance in a Bulls uniform since May 3rd, had a clean inning, as did Brandon Gomes back from his third trip to the Rays. Leslie Anderson was back from the disabled list to lead the Bulls in hitting, but it was timely sac flies by O’Malley, Feliciano, and Gimenez that made the difference. Along with a steal of third base by Rich Thompson that set up a run. The Bulls play two games at home Wednesday and Thursday, hit the road for three games, take three days off, hit the road for four games, then come home. Put another way, if you don’t get to Wednesday’s or Thursday’s game, you won’t have another chance until July 16th! Keep an eye on the innings. A couple of these guys really haven’t had much time with the Bulls. Amazing how good this team can look when playing Buffalo. Word is Joyce is coming to town for our 2 game home set.